Located entirely within Gwinnett County, these 10 miles of newly constructed lanes begin north of the existing I-85 Express Lanes at Old Peachtree Road and extend to Hamilton Mill Road. The I-85 Express Lanes Extension are charged separately from the original I-85 Express Lanes. Charging for the Extension separate from the existing I-85 Express Lanes allows for the toll pricing to reflect the typically lower level of congestion that will be experienced on the Extension than on the portion of the existing lanes closer to I-285. If both segments were priced together, the pricing would be based on the higher levels of congestion that occur closer to I-285, resulting in the extension pricing being higher than traffic conditions warrant on the new 10 mile section. This makes it easier for customers who may only want to travel on one or the other. After traveling in the Express Lanes, customers will see two separate charges on their Peach Pass account as 85 A (I-85 Express Lanes) and 85 B (I-85 Express Lanes Extension). Who can use the lanes? Any motorist with a registered account and an active Peach Pass mounted on their vehicle can access the I-85 Express Lanes Extension. As with the I-85 Express Lanes, 3- or more person carpools, Alternative Fuel Vehicles (AFV) with the proper AFV license plate (does not include hybrid vehicles), motorcycles and transit vehicles will continue to ride for free on the I-85 Express Lanes Extension. 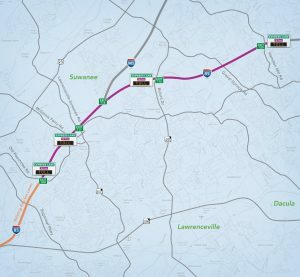 When traveling north in the I-85 Express Lanes, motorists will see a sign showing the new destination points with a section that reads “NEW TOLL RATES.” When motorists are traveling southbound on I-85, they will see signs with the destination and toll rates for the I-85 Express Lanes Extension. Once traveling in the I-85 Express Lanes Extension, they will see a sign with new destination points and the section reading “NEW TOLL RATES” prior to the I-85 Express Lanes beginning. How much will it cost to use the Lanes? The I-85 Express Lanes Extension will be charged separately from the original I-85 Express Lanes. This makes it easier for customers who may only want to travel on one or the other. Charging for the extension separate from the existing I-85 Express Lanes allows for the toll pricing to reflect the typically lower level of congestion that will be experienced on the Extension than on the portion of the existing lanes closer to I-285. If both segments were priced together, the pricing will be based on the higher levels of congestion that occur closer to I-285, resulting in the extension pricing being higher than traffic conditions warrant on the new 10 mile section. After traveling in the Express Lanes, customers will see two separate charges on their Peach Pass account as 85 A (I-85 Express Lanes) and 85 B (I-85 Express Lanes Extension). Georgia’s Express Lanes are dynamically priced, meaning as demand for use of the lanes increases, the toll amount rises to ensure that you experience more reliable trip times.